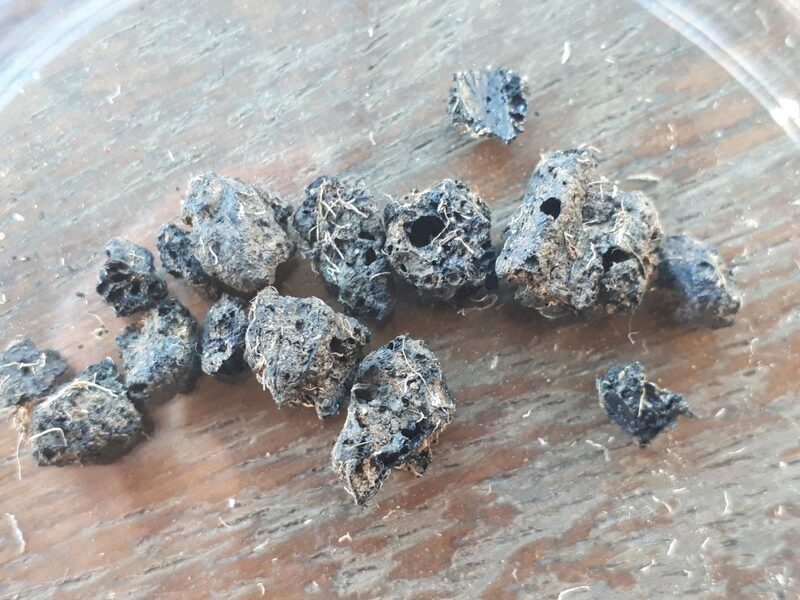 Our archaeobotanist, Lara Gonzalez Carretero, has uncovered what is believed to be the earliest physical evidence for beer-making in the UK, dating back more than 2000 years to the Iron Age, on the A14 Cambridge to Huntingdon improvement scheme. Evidence of early Iron Age porridge and bread-making has also been uncovered. The tiny fragments of charred residues from the beer making process were discovered in earth excavated with other archaeological finds. When we find an archaeological feature or a particular area of a site that we’d like to take a closer look at, a sample of the soil is taken and processed by our environmental team, who are able to make sense of the tiny clues that are not often visible on site. That’s where our team of archaeobotanists come in! We’ve taken just under 9000 environmental samples from various points of interest along the route of the A14C2H. These samples hold tiny but vital pieces of information that can transform our understanding of how humans have interacted with the flora and fauna around them through time. Plant remains like seeds and grains can tell us how people used, cultivated and manipulated plants and vegetation to create food, drink, clothing and shelter. I knew when I looked at these tiny fragments under the microscope that I had something special. The microstructure of these remains had clearly changed through the fermentation process. Air bubbles typical of those formed in the boiling and mashing process of brewing are present. It’s like looking for a needle in a haystack but as an archaeobotanist it’s incredibly exciting to identify remains of this significance and to play a part in uncovering the fascinating history of the Cambridgeshire landscape. A closer look at the fragments under a microscope shows the differences between fragments of beer making residue (left) and the bread (right) or porridge-like substances. It’s possible to see their porous and starchy microstructure, and sometimes even small fragments of grains and small cereal tissues. The porous structures of these fragments are quite similar, however under SEM (Scanning Electron Microscopy) we start to see why it’s likely that the image on the left is evidence of the beer making process as it contains larger pieces of cracked grains but no fine flour. We can also see in these remains the typical air bubbles which form in the boiling process, used to make beer, rather than the baking process used to make bread. Further analysis into the fermentation process involved in brewing will hopefully tell us more. At the moment, we believe these fragments are believed to be Iron Age, which means they could date back as far as 400BC, but further research will help us to unravel the story of the sites these fragments came from and provide a glimpse into eating and drinking in ancient Cambridgeshire.